A crispy crepe with all goodness of dals. Wholemeal dough stuffed with spiced mashed potato, rolled thick & toasted with ghee. Upma made with a combination of broken rice & dals cooked to perfection. 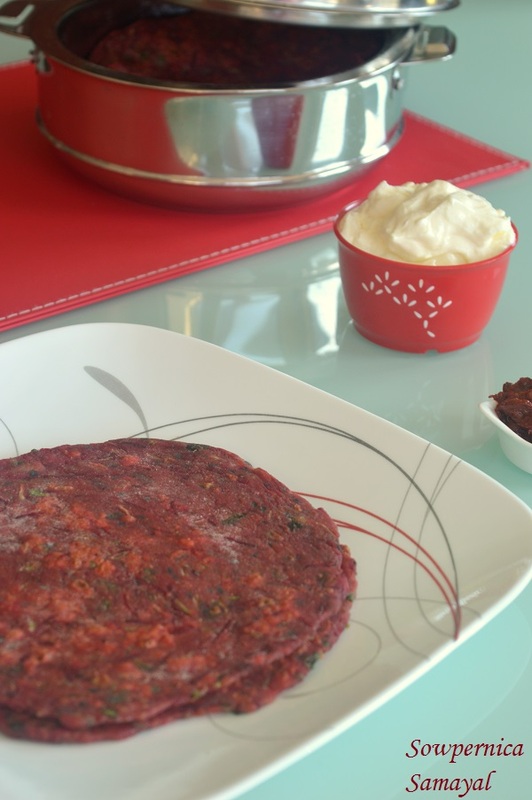 Grated beetroot kneaded with wheat flour and other spices and rolled to parathas. An great tasting upma with bread & channa. Uthappam with a different taste, a great way to use left over bread. A great way to add broccoli to your meals, especially with kids. Parathas made with finely shredded cabbage & wholemeal flour. A simple evening snack made with idli batter & cheese. Soft and tasty parathas made with boiled chickpeas. An easy to make delicious breakfast/dinner recipe. A thin & crispy spread of dosa batter, best accompanied by coconut chutney & kothsu. Lentil, soaked & ground deep fried in the shape of doughnuts. A crisp dosai made with left over dal which can fill your appetite. Parathas stuffed with left over dals/khachori masala. A flatbread with spicy cauliflower stuffing, served with butter, pickles. Idlis made with rava in an instant. A healthy, steamed breakfast popular in the southern part of India. A popular breakfast in most homes of South India, served with coconut chutney & kothsu. A thin & crispy crepe made with instantly prepared batter of flours. Fluffy & tangy dhoklas made with left over idli batter. Garama garam for rainy days. A healthy steamed evening snack with minimal oil, served with coconut chutney. Is a delicacy popular in Southern interior parts of India made with crumbled parottas. Yet another form which idli batter could take. A handy make when you do not have much time to invest in cooking. A delicious tasting paratha packed with nutrition. Lentil crisps with the goodness of oats. An ideal & nutritious breakfast packed with the goodness of oats. Oats Porridge prepared with left over rasam in 2 minutes. A microwave preparation. A thick spread of dosa batter loaded with onions & carrots. A great tasting, quick make with parottas & left over kadai paneer. A easy, tasty and quick make with flattened rice. A popular breakfast in southern part of India, served with coconut chutney & kothsu. An easy lunch box make, kids would love it. A filling, healthy millet recipe. Made with grated potatoes and besan. A healthy addition to traditional adai. An anytime quick make but yet a balanced meal, served with coconut chutney. A delicious make using left over idlis & finely cut onions.